Government • City's planning board balks over rezone request, citing traffic concerns. 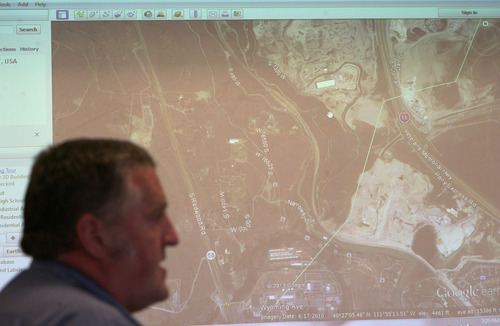 Steve Griffin | The Salt Lake Tribune With a map of the area projected on a screen, Brooks Baker, who was representing the Corporation of the Presiding Elder of the Apostolic United Brethren, talks during a Bluffdale Planning Commission public hearing on a request by the group to rezone about 26 1/2 acres from agricultural to high-density residential. The hearing was held in Bluffdale, Utah Tuesday April 2, 2013. Steve Griffin | The Salt Lake Tribune Brooks Baker, who was representing the Corporation of the Presiding Elder of the Apostolic United Brethren, talks during a Bluffdale Planning Commission public hearing on a request by the group to rezone about 26 1/2 acres from agricultural to high-density residential. The hearing was held in Bluffdale, Utah Tuesday April 2, 2013. Steve Griffin | The Salt Lake Tribune Brooks Baker, who was representing the Corporation of the Presiding Elder of the Apostolic United Brethren, talks during a Bluffdale Planning Commission public hearing on a request by the group to rezone about 26 1/2 acres from agricultural to high-density residential. The hearing was held in Bluffdale, Utah Tuesday April 2, 2013. 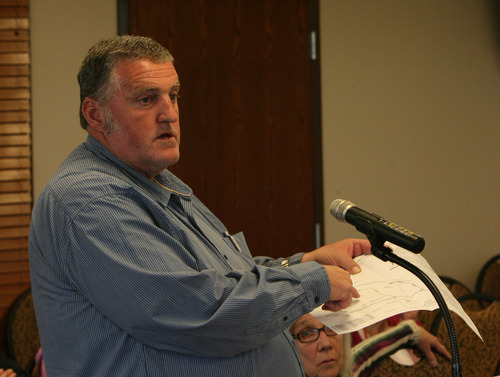 Bluffdale • The planning commission in this small city voted 4-0 Tuesday to table a zone change that would allow the polygamous Apostolic United Brethren to build a retirement community. Commissioners first tried to approve the zoning change, but the motion stalled in a 2-2 vote. Planning Commissioner Lee Bertoch did not attend the meeting. So the commissioners in attendance then tabled the discussion. Polygamy was not the hold-up on the rezoning Tuesday. Instead, concerns revolved around the winding Jordan Narrows Road that provides single access to the 26-acre property at 1242 W. 16580 South, along with water and sewer inadequacies. "There&apos;s only one access in and one access out and the road is very, very, very narrow," said Helly Kunz-Nelson, a resident of neighboring Jordan Narrows Estates. "I have no problem with a subdivision as long as there&apos;s another access." "Every meeting they have a traffic jam," Kunz-Nelson added of AUB&apos;s Sunday services that draw good-sized crowds. "I&apos;ve driven on that road, and it scares me in broad daylight," said Planning Commissioner Connie Pavlakis, adding that there were so many major infrastructure issues with the land that she wondered if they should proceed with the rezone. Brooks Baker, a AUB member who asked for the zoning change, said Sundays are their big days, drawing 200 to 300 cars depending on the weather. The retirement homes are needed because "we have a lot of women who have lost a husband," Baker said. The AUB  also known as the Allred Group  practices plural marriage between consenting adults. The group currently has two homes and operates a church and school on the property, and it hoped to add eight retirement homes that could house some of its elderly women. The requested zone change would shift the land from agricultural use with one residence per five acres to one home per acre, and would also allow clustered development so the homes could be built closer together with more adjacent open space. The Jordan Narrows Road ultimately intersects with Redwood Road, but when clogged with traffic, the cars impedes the ingress and egress of residents who live off of 1400 West. The city&apos;s general plan foresees a shift to one-acre lots in that area, and Bluffdale Economic Development Director Grant Crowell said subdivisions are already allowed in every zone. While a school and church would likely not be possible on single-access land under current zoning requirements, those existing uses were grandfathered into the AUB site, Crowell said. "There are a lot of concerns to review here," Crowell said, referring to utilities, water and sewer systems and other infrastructure requirements that would be addressed during the subdivision review process. Pavlakis asked that a thorough traffic study be conducted, funded by AUB, and also that city staff review infrastructure issues and whether the Jordan Narrows Road can be widened. Baker expressed frustration over the board&apos;s decision and was unhappy that AUB would have to pay for a traffic study. "The city suggested we apply for the rezone," Baker said. "That&apos;s why it&apos;s so frustrating that they turned me down. They&apos;ve already decided they&apos;re going to go to one acre down there, so I didn&apos;t think it was a problem." The mainstream Church of Jesus Christ of Latter-day Saints, which has no connection to self-described fundamentalist Mormons, publicly abandoned polygamy in 1890 and excommunicates members who support or practice plural marriage.